Picnics are a good way to spend quality time with family, friends and your four legged friends. A picnic gathering is a great way to bond with each other too. Most picnic venues happen in parks, near beaches or where there are beautiful scenic views in the great outdoors. What a wonderful way to relax and enjoy the company around you. Believe it or not but exercise is a great stress reliever. Join in some children’s games and let your pet have fun too by throwing an Organic Hemp Frisbee around. These Frisbee’s are found on Amazon as well as this Eco-Friendly Picnic Basket. If you don’t have a picnic basket or need to replace your current one, ShoppingWarehouse, Picnic World and Amazon sell picnic baskets which are made from all-natural materials, renewable resources and free from AZO Dyes. Why are ants always associated with picnics? Ants can predict rain and bad weather well before the weather bureau uses their weather balloons and complicated satellite equipment which sends data back to them. Yet, you see cartoons where ants are carrying off the food and the picnic basket. Ants are misunderstood little creatures. They come inside homes when they forecast rain in the air and go to higher ground when the situation is more serious……..like cyclones/hurricanes etc. Squirrels collect ‘nuts’ to store for the upcoming winter; so too ants look around for food for safe-keeping. So the next time you decide to have a picnic, check out what the ants are doing first. Looking for biodegradable picnic plates? 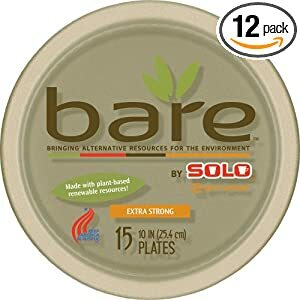 Solo sell their “Bare” bamboo plates on Amazon. Biodegradable and Disposable Picnic Plates sold by Australian eBay Seller Tierra Style Home Wares. Their plates are made from bagasse residue fibre which remains after the sugar cane juice extraction. It’s fully compostable in 30-90 days, 100% food safe and suitable for hot/cold drinks. Contains NO additivies or plastic lining. Ships within Australia. Set of 8 large 260mm/10 ” round plates, natural and undyed. Need help in finding an eco friendly product? Contact Erin for all your eco shopping needs. Your privacy is assured.